Why not treat yourself and order one of our Crown Inn Hampers to enjoy in your room. 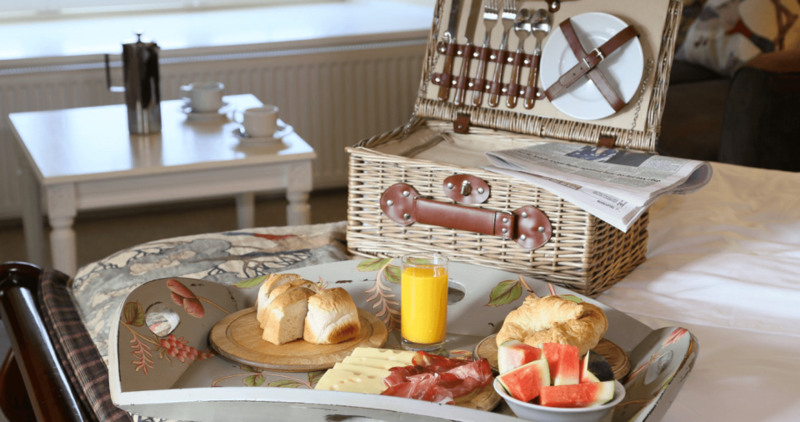 For our bed and breakfast customers who would prefer to enjoy their breakfast in their room, we can provide your continental breakfast in a hamper, delivered to your room at no extra cost with your choice of tea or coffee and your favourite newspaper. Please order before 8pm the night before the hamper is required. Served between 7.30am and 9.30am Monday to Saturday and between 8am and 10am on Sundays. Customers staying in our garden rooms (Wadenhoe and Burghley) can also plump for one of our freshly prepared dinner hampers to enjoy in their own private garden. Packed with Crown Inn specialities and local artisan delicacies, and delivered to your door in the evening for you to savour at your leisure. Each comes with a bottle of house wine. Dinner hampers for two are priced at £60. Dinner hampers are served during the summer months (May to September) and are weather dependent to ensure you can enjoy them in your private garden. Please order when booking your room or for multiple night stays by 10am on the day required. Our residential guests can also enjoy a freshly packed lunch to take with them as they explore our beautiful countryside. Please ask for more details. Orders must be placed before 10am on the day required, please allow half an hour for preparation. For full details and to place your order please contact us.